Young Ali, who was trapped for five hours under his house in rubble when it collapsed during a conflict with the terrorist group ISIL, also known as Da’esh, has recently returned with his family to West Mosul. Four years of data collected by the International Organization for Migration (IOM) for its Displacement Tracking Matrix (DTM) report, concludes that 1,931,868 people currently remain displaced – the lowest figure since November 2014 – and that nearly four million people have managed to return home overall. “IOM DTM data has documented the phases of the crisis and it has been critical for planning humanitarian assistance,” said Marta Ruedas, the UN Humanitarian Coordinator in Iraq. 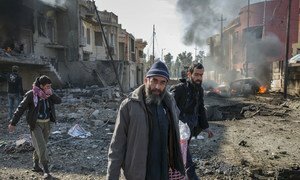 Since January 2014, Iraq’s war against the terrorist group ISIL, otherwise known as Da’esh, has displaced six million Iraqis, comprising about 15 per cent of the country’s population. Last December, Iraqi Prime Minister Haider al-Abadi declared an end to the campaign to defeat the group. Across Iraq, internally-displaced people (IDPs) continue to return home at a steady pace, but slower than in 2017, says the report. The greatest number of returnees – some 1.49 million – have made their way back to Ninewa, with 1.27 million returning to Anbar province; and nearly 553,000 to Salah al-Din Governorate. Some 77,000 have returned to homes in Baghdad. While overall, 97 per cent have returned to their own residences, two per cent have gone to homes other than their own; while one per cent, or 19,000 vulnerable individuals, have sought shelter in religious buildings, schools and abandoned buildings. The remaining IDPs are concentrated in: Ninewa (602,000), Dahuk (349,000), Erbil (217,000), Salah al-Din (169,000), Sulaymaniyah (151,000) and Kirkuk (124,000). Of the displaced, 1.2 million are in private residences, 574,000 in camps, and 176,000 in critical shelters. “Data on returns is also essential for this next phase of our support for recovery and reintegration.” Ms. Ruedas explained. According to latest DTM data, people cited the improved security situation, more readily-available housing, encouragement from community leaders and support from friends and relatives, as factors influencing their decision to go back home. Obstacles that confronted displaced families include damage or destruction of housing and public infrastructure; a lack of financial means and job opportunities, and a lack of safety and security. “DTM makes an important contribution to humanitarian efforts in Iraq by informing the direction of resources to displaced and returnee populations,” said IOM’s Chief of Mission in Iraq, Gerard Waite. The DTM is IOM’s information management system to track and monitor population displacement during crises. Since early 2014 IOM Iraq has been producing data sets, monthly reports and thematic reports, including on the Mosul crisis, when the city was occupied by ISIL terrorists; obstacles to return, location assessments and emergency tracking. This information is shared publicly to aid humanitarian efforts. Despite a myriad of “long-neglected social, economic and development needs”, the Head of the UN Assistance Mission for Iraq (UNAMI) on Wednesday said progress had been made towards recovery and stability in the battle-scarred country, and called for Iraqi political leaders to continue to “work for national reconciliation” through “inclusive” solutions.